I really would like to give this book more than three stars. It is smart, persuasive, well-researched, and almost always right. It also, unfortunately, contains sentences that go on too long, favors ostentation over clarity, and is boring. Nevertheless, it is an important book. Edwin Vieira convincingly argues against the United States Supreme Court's decision in Lawrence v. Texas. The Lawrence Court illegally employed foreign law to interpret the U.S. Constitution and preposterously purported to strike down all legislation based on traditional morals. Vieira demonstrates the absurdity of "judicial supremacy," the notion that the U.S. Supreme Court is the supreme interpreter of the U.S. Constitution. And then he demonstrates several practical things "We the People" can do to curtail the Supreme Court's power grab. The options include amending the Constitution (not ideal because it implies the Supreme Court got the pre-amendment interpretation right), pardons by the President, presidential refusal to enforce an unconstitutional decision, limitation of the court's jurisdiction, and removal of judges for lack of "good behaviour," among other possibilities. Many of the proposed actions are not currently politically possible. However, We the People delegated to the judicial branch the judicial power. We the People have the right and responsibility to ensure that power is not abused. 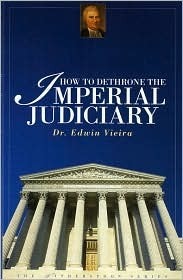 How to Dethrone the Imperial Judiciary presents an important warning and challenge and ultimate plan of remediation. It is worth reading despite its faults.